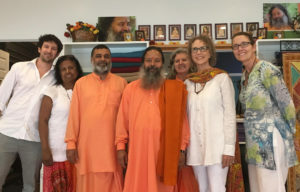 From left: Judy Peterson, Swami Atmavidyananda Giri, Yogacharya Richard Peterson, Paramahamsa Prajnanananda, Swamini Sampurnananda Giri, and Marydale in the studio at Param Yoga. 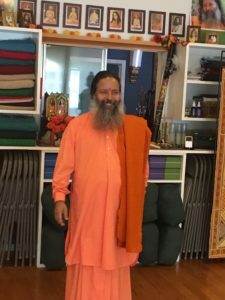 “Dreams do come true.” That’s what a beaming new student said to me yesterday as she excitedly looked at the photo of Paramahamsa Prajnanananda by the front desk. She pointed at his picture, asked his name, and then explained that she met Him, by chance, last year while visiting Bogotá, Columbia. He was at the hotel where she was staying, and meeting Him touched her greatly, although she did not know who He was, nor did she know how to find out who He was or how to find Him again. Arriving at our studio and finding Him right here in Chatsworth was the answer to her dreams, for now she could finally know Him! September 18, 2015 was the first day that I physically met Guruji Baba and had the rare privilege to talk to Him for quite some time. It was during this initial conversation that we talked about many things, including the desire of West Coast Kriyavans to have an ashram in Los Angeles someday. It was then that I shared my heart’s desire to have Him come here to visit and bless our community. He playfully waved His hand in the air and said, “We shall see.” That moment in time turned out to be the beginning of a Divine friendship, beyond my wildest imaginings, with the Divine Yoga Master. A dream come true…and the dream continues to unfold in ways that are otherworldly and fill this heart with continuous bliss. September 8, 2017, two years after this initial conversation, Guruji Baba—smiling and filled with palpable joy—arrived at our humble studio and blessed our space with Divine, eternal love. He was so happy to be in our Spiritual home and said repeatedly that it was “beautiful, very beautiful.” He took the time to sit and briefly meditate with us, further impregnating our home with His Love. This prelude of grace began six days of continuous bliss to be in His presence, supporting, serving and loving Him in every breath. 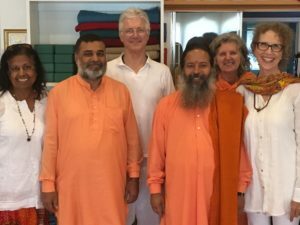 Lorne Schussel, Judy Peterson, Swami Atmavidyananda Giri, Paramahamsa Prajnanananda, Swamini Sampurnananda Giri, Marydale, and Kerry Morris. The purpose of His visit was to celebrate with us the 125th birth year of Paramahamsa Yogananda, our Param Guru in the Kriya Yoga International lineage. It has been self-evident to me for a very long time that Prajnanananda carries the living shakti of Yogananda and they are One. Therefore, this particular celebration was a rare and auspicious one that will never come again, and we were all blessed beyond measure to play witness to all the precious and memorable moments that transpired. While with us, Prajnanananda spoke on many occasions, transferring His endless well of wisdom directly to each one of us. Some time ago, He remarked that He could talk forever, and after being with Him time and time again, I have no doubt that not only is that a true statement, but that every word He utters is like honey for one’s soul. While with us, He encouraged us to get rid of our fault-finding nature, be aware of God’s presence in every moment by being aware of our breath, realize that our own personal willpower affects our destiny, and to remember that, in Kriya Yoga, breath is the mantra, mind is matter/mind is inertia, and expectations are natural, but never expect your expectations to be fulfilled. In my personal attempt to sum up the week’s transmission of Divine wisdom and love, He encouraged us to read a little, meditate more, and remember God all the time. From the moment I learned last December that we would be hosting Guruji Baba’s visit here until the final moment of the tour de force, I have been filled with tremendous joy for the privilege of serving both Yoganandaji and Prajnananandaji in this humble way. And it was indeed a dream come true on layer upon layer of my soul, with the highlight of having my spiritual teacher here in the flesh to meet and bless so many of you who are near and dear to my heart. Now you have experienced firsthand the endless Love that this Divine Master has for you and the fulfillment of your highest hopes, dreams, and wishes. May you hold Him in your hearts and feel His ever-presence in our humble home.